Brass Locknuts are used for fastening glands to the gland plate they are identical material to the gland, corrosion effects are minimal. 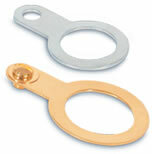 With ISO metric thread, the lockouts can secure the brass cable glands to a gland plate. Installed between the gland entry & equipment, providing an earth bond connection. Produces an earth bond connection for electrical continuity. Brass BS 2870 CZ123 lead. With Brass Screws & Washers, Plain Hole. Reducer allows a PG threaded gland to be terminated in enclosures with different entry thread form (ET NPT BSP BSPT). Reduce the entry thread diameter of enclosures. Metric (ISO) ET NPT BSP BSPT. Brass casting BS 2874 aluminium alloy & galvanized steel. Stop plug may be used to close thread entries as a means of sealing & stopping unused thread entries in flame proof enclosures. Push on shrouds are used to minimize the risk of dirt or foreign substances gathering on the cable gland body, and/or point of cable to a gland interface. For all types of gland applications to provide additional protection & enhance the IP rating of the gland termination. PVC (Black); Silicon (Orange); Polyamide or Nylon (White); Red Fiber.